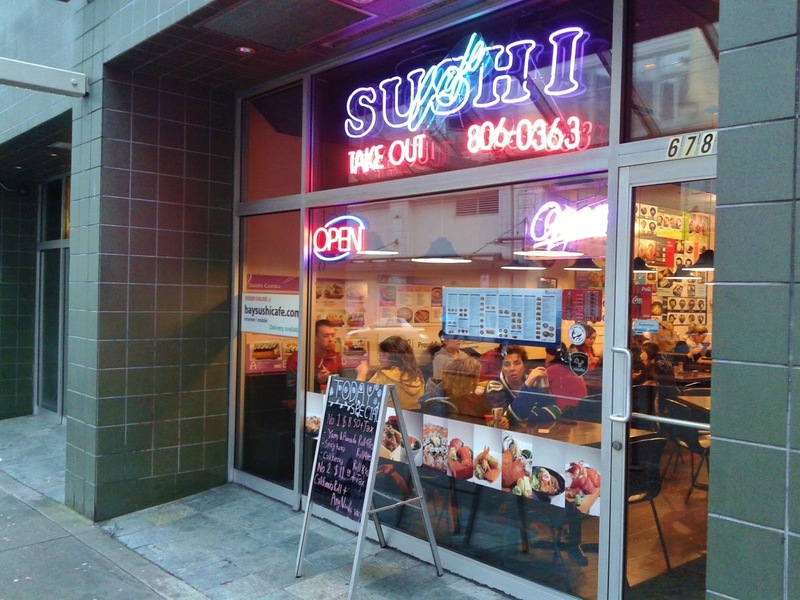 Bay Sushi Cafe is one of downtown Vancouver's most popular express sushi establishments, and I went in thinking that cheap prices would be the biggest attraction. This was not the case. There were both rolls and bento boxes over $10, but despite that, there were hardly any free tables left for me to sit at. Since the prices weren't exactly cheap, I got my hopes up for some quality food. It took me some time to realize that you actually order and pay at the front. This usually means Raymond-taking-so-long-that-the-cashier-and-the-other-people-standing-in-line-get-frustrated time. However, being a polite gentleman, I went over to the menu that was taped to a wall near the front entrance, where I could take as many hours as I wanted to formulate my order. Paying at the front also meant that I got to see how much of a fatty I was compared to other people. While everyone else was ordering about $10 to $15 of food, my order easily busted the $25 mark. I overheard some of the staff members discussing how to actually put my food onto a tray. They ended up giving me two trays instead. 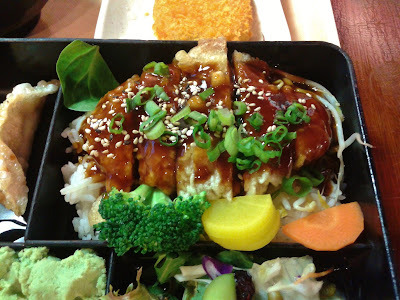 I received a Miso Soup as part of my Chicken Teriyaki & Sashimi Bento. 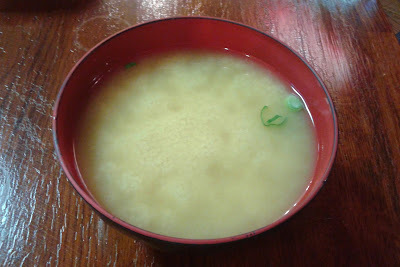 The Miso Soup came with seaweed, green onion, tofu, and a rather generous helping of salt. There was also quite a bit of miso paste, and for once, I think this Miso Soup actually contains a bit too much miso paste. 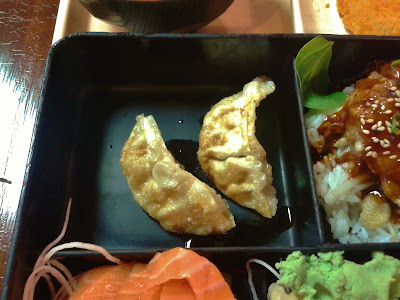 Moving on to the bento box itself, the Gyoza had a mild tangy flavour, and the wrapping was so crispy that it bordered on being hard. There wasn't quite enough pork filling to give the Gyoza a well-rounded flavour. The Chicken Teriyaki looked very appealing, but it turned out to be the low point of my meal. The chicken tasted bland, and the skin on top was soggy. Did they accidentally drop it into a bucket of water before serving it to me? The rice ended up being decent, though the bean sprouts were unevenly dressed with teriyaki sauce. The sashimi fared slightly better. 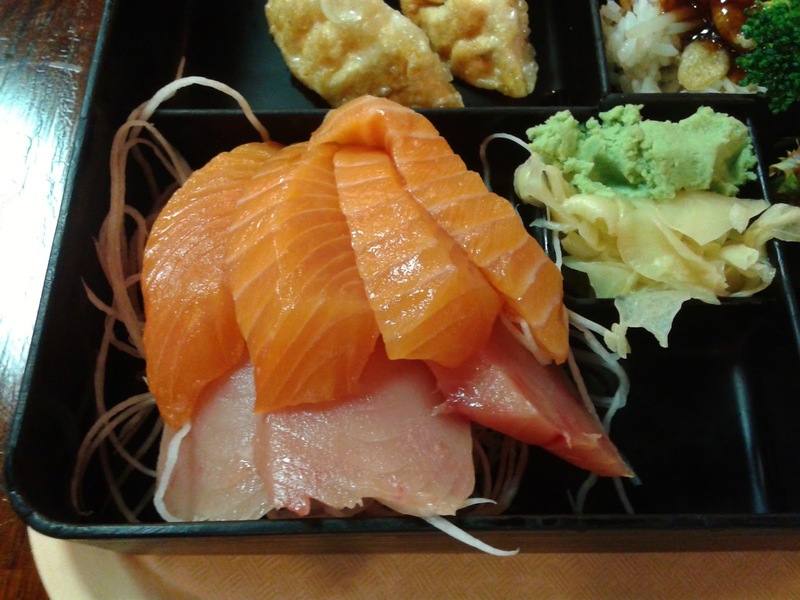 The Salmon Sashimi was delectable, fresh, and cut to just the right thickness. I also liked how there were four generous pieces of it. The Tuna Sashimi was soft, but it was also slightly watery and mushy. Did they accidentally drop this into a bucket of water too? The Salad came with lots of different ingredients, including edamame, shelled sunflower seeds, daikon, and mixed greens. There was not quite enough dressing for the salad, so it tasted a bit dry. 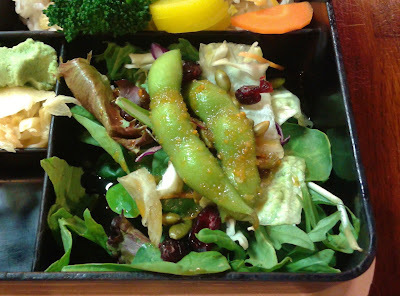 However, I did appreciate the variety in this salad, which made it less mundane. 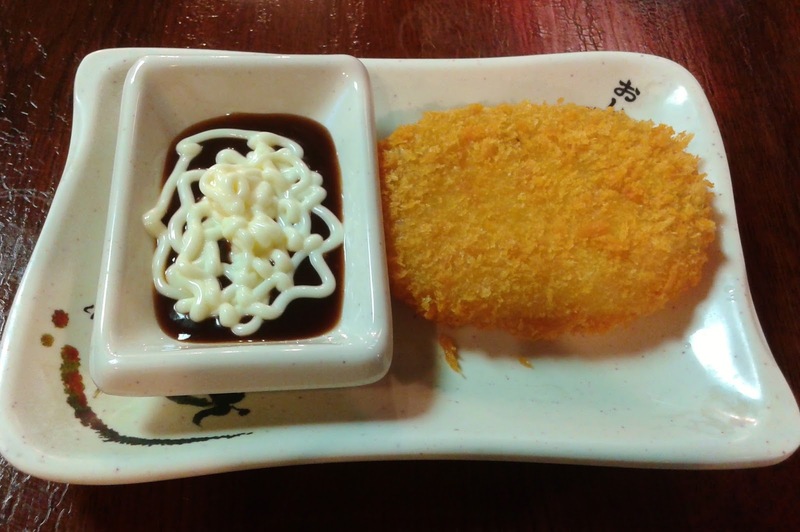 Besides the bento, I also had a large croquette, which came with lots of soft potato-based filling. The interior reminded me of a well-executed mashed potato salad, while the exterior had an appealing amount of crispiness. 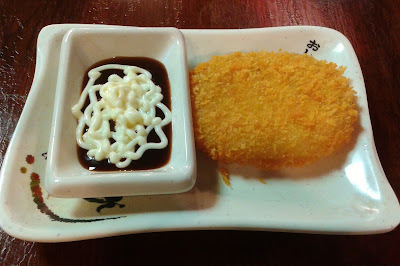 I'm not sure about the squiggly presentation of the dipping sauce, but the Worcestershire sauce and mayonnaise combination did liven up and harmonize well with the croquette. 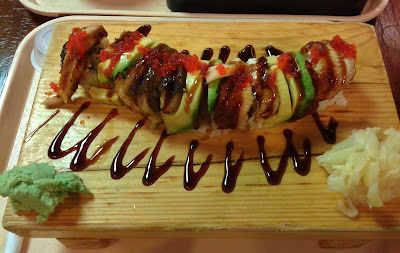 My final item, the Dragon Roll, consisted of two tempura prawns, unagi, avocado, and masago. The flavours went well together (as is typically the case with a Dragon Roll), and I was pleased with the soft, sweet unagi on top and the fresh avocado. Unfortunately, the prawn tempura was severely over-fried, and my teeth did not exactly appreciate the workout from the hard batter. The staff at the front were friendly and energetic, and there were a considerable number of chefs working on the food. 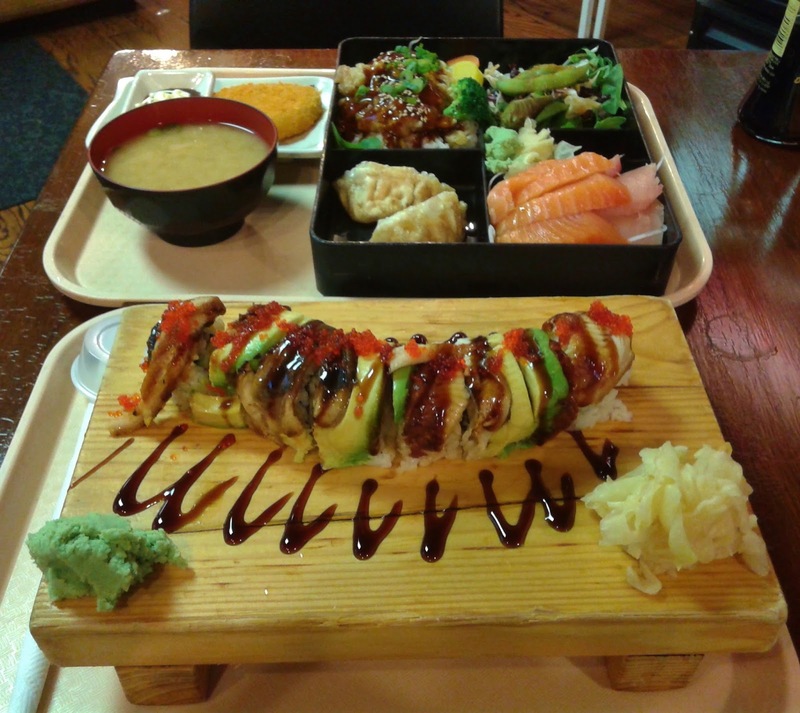 A trend I noticed here was that the food tended to look better than it tasted. All of the food was beautifully and neatly presented, yet texture and taste issues seemed to be rather abundant. 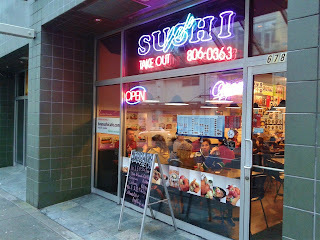 I'm pretty sure this place did not get its popularity based on food appearance alone. Was there something that I missed?